This was my second trip to the magical and mystical islands of the Malta archipelago, comprised of the three major islands of Malta, Gozo and Comino. Malta is located in the heart of the Mediterranean Sea just south of Sicily. Gozo means “joy” in Castilian and this second largest of the Maltese archipelago is filled with charming medieval villages; beautiful countryside; breathtaking landscapes and dramatic cliffs; and all encircled by turquoise to deep sapphire blue seas. Getting to Gozo is an easy 25 minute ferry ride from Northern Malta that transports both passengers and vehicles or if you choose not to drive or take an organized tour, you can catch a sightseeing double-decker tour bus from the harbor of Mgarr where you land. If you like to wing it, there are public buses that ply the island from top to bottom. 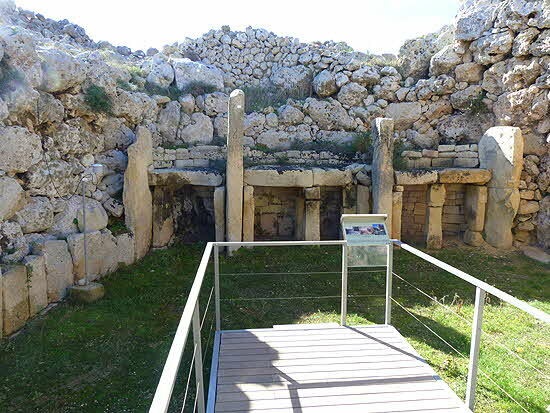 On my last visit I focused my review on the main island of Malta and spoke of man-made artifacts as old as 7,000 years, but this time natural as well as ancient man-made marvels captured my interest on the island of Gozo. 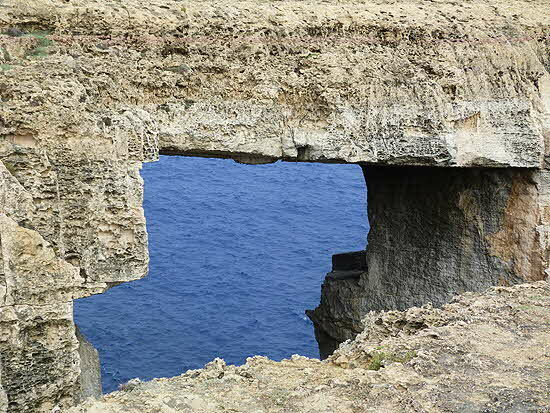 Malta has it all… well it did have it all until the collapse of the Azure Window, the spectacular limestone arch in the Dwejra area, that recently and unexpectedly fell into the sea, a fact reported by the world press. The islands of Malta were raised from the sea as evidenced by bits of marine life and shells hardened into rock solid promontories that rise heavenward. Due to erosion, openings are cleaved into the rock face and periodically portions of the towering cliffs collapse back into the sea. 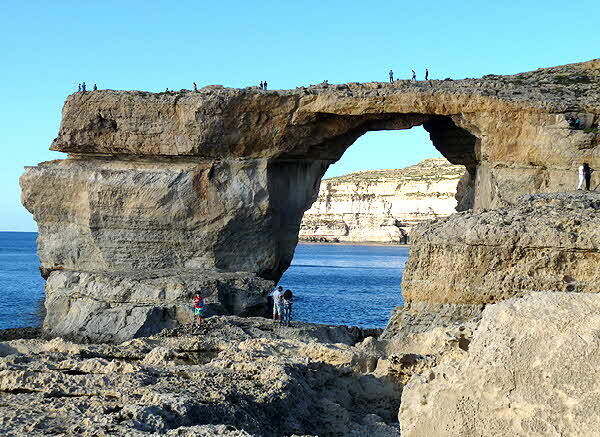 Such an occurrence shocked nature lovers when after a storm in March 2017 the limestone arch - the iconic symbol of Gozo - gave way. But all is not lost… when one window closes another opens and our knowledgeable guides from “Exclusively Malta” knew just were to take us to see what is hoped will be the replacement. The site is currently underdeveloped and a bit hard to find so I recommend contacting Damon or Jason Camilleri Allan at “Exclusively Malta” to arrange a visit. Of course the Dwejra area has more to offer than the Azure Window. There is swimming at a secluded bay, or for the more adventurous, diving in some of the best dive sites in the Mediterranean such as the “Blue Hole”�� where one can explore underwater caverns, grottos, ship wrecks and coral reefs. 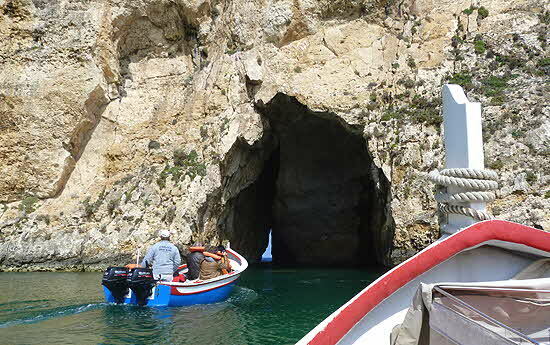 Or take an exhilarating boat ride through the “Blue Grotto”. I must say this provided one of the most enjoyable experiences of the day for me. It was a picture perfect day as it often is in Malta, bright sunlit cliffs reflected in the amazing blue sea and fluffy pink tinged white clouds high overhead. I boarded a fisherman’s luzzu (flat-bottomed boat) along with seven others in our group; we buckled on our life jackets and zoomed into the darkness of the cliffs. Near the ebb and flow at the waters edge, one could see little orange buds of the living coral clinging to the rocks and as my eyes adjusted to the gloom I leaned back to see the staggering height of the cavern we were passing through. Out into the open sea with the cliff wall behind us as we bumped over the waves and went from cavern to cavern exploring the Cat’s Cave, Filfla Cave, Reflection Cave Window Cave, Blue Grotto, Circle Cave, Elephant’s Foot, Honeymoon cave and finally Blue Window Cave. After a while I got turned around as to which cave was which, but I never tired of entering each of the mighty crevices in the cliff walls; it was as if the yawning blackness swallowed us like a sea monster of old Noah and the whale, in stone. The ride lasted just under half an hour of zipping, swirling, bumping and shrieking with joy. Opposite where the Azure Window once stood is the Fungus Rock. Back in the day, the Knights of The Order of St John (1530-1798) was a hospitaller order before becoming a military order. They ruled over Malta ostensibly to protect the west from incursions by the “infidels” but in their role tending to the sick, came across a tubular plant believed to have curative properties growing exclusively on this rock. The rock was off-bounds to all except those collecting the special mushroom. A watch tower was erected to “watch”�� over the rock and it’s still there checking out all comers to the area. Eventually the healing powers of the mushroom were found to be bogus but one wonders how many were severely punished or killed by the Knights for harvesting the fungus before its true nature was revealed. On the other side of the island, not far from the Ggantija Temples is Calypso’s Cave on the outskirts of the village of Xaghra. It is reputed to be the place where Homer’s Ulysses and the nymph Calypso lived for seven years. The cave is no longer accessible, but the view that held Ulysses a love-captive is. There, at Ramla Bay along the strikingly beautiful azure waters that surround the island, you will find one of the most popular red sandy beaches called Ir-Ramla I-Hamra (hamra means red and ramla means sand). And speaking of the Ggantija Temples, this imposing UNESCO World Heritage Neolithic site is considered to be one of the oldest free-standing structures in the world. 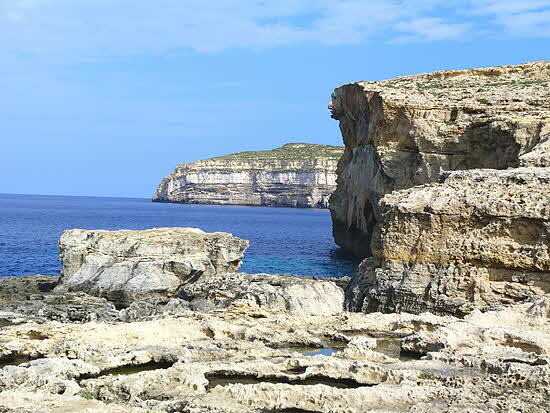 The site dates back to around 3,600 B.C., before the wheel was introduced on Gozo. Of course, there is a myth about its construction. It centers on the giantess Sansuna who allegedly, while carrying a baby in one arm, carried the massive stones from the south coast of Gozo on her head and built the two temples in just one night. 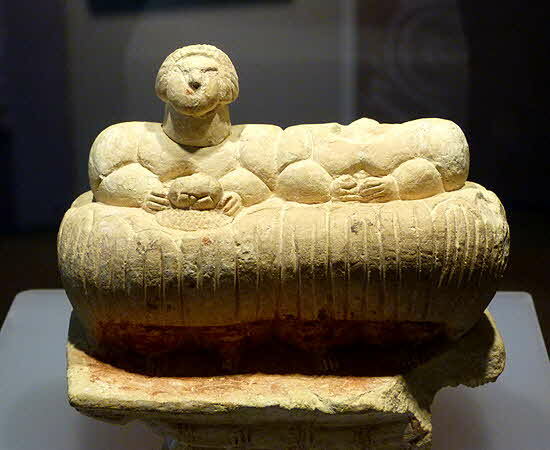 This legend supports the theory that the temples were the site of a fertility cult which is further strengthened by the many female statues found both here and at other temple sites on Malta. It is believed that a great portion of the Ggantija site is still to be unearthed hopefully leading to more discoveries relating to its builders... no offense implied to the legend of Sansuna! Of course this is a small taste of the things to do and see on Gozo but it seems everyone who goes there is captivated by her charms and, like Ulysses, is tempted to stay long after the ferry has sailed into the sunset.